o Mantra to chant: "Om aim hring kleem chamundayi vichche". o Navratri commences with the first night devoted to the puja of Shailputri devi. 'Shail' means mountain and refers to Parvati, wife of Lord Shiva, the daughter of king of the mountains Himavan. Shailputri holds in her two hands a trident and a lotus. She is mounted upon a bull. o Special benediction-as all the shradh souls leave the planet this night the energies specially work on the temple (memory) chakras of all in the planet. This is a major healing past karma and removing blocks, bestowing lilac light healing trauma emotions and thoughts. o We see white seven-pointed stars of light in the sky falling on the shoulders reducing burdens, activating also the navel chakra to create new activities of business, work, healing, and purpose of life. o The stars also accumulate mostly in water and liquids. Take pure water, coconut water, juices. o Offering: one pomegranate in the morning before 9 am and accept as prasadam (blessings) in evening, share with others-offer candles morning and evening (after sunset). Mentally offer all fragrant flowers, fruits, gems, clothing. o Mantra to chant: "Om doom durgaya namah". o Bhramcharni devi is a store-house of knowledge and wisdom. Rudraksha is her most dear ornament. One hand holds a "Kumbha" or water pot and the other rosary beads of rudraksh. o Special benediction--She personifies love and loyalty. We see energies of blue light manifesting bringing empowered actualization of goals. Mantra chanting empowers throat chakra, rectifies negative thoughts and blesses access for more liberating super karma and attracts forgiveness of negative karma. o At this time blue light radiates from plants and trees in fine filaments activating throat and speech energies. Whatever is spoken will multiply for the next 6 months so on this day one must be particularly attentive to what one says out loud especially. o We see the presence of energies of their Lordships Sita Ram--golden triangular energies of blessing as big as the human head descending from the north-east. o Offering: two apples before 9:00 am and a candle/lamp to Bhramcharini devi morning and evening (after sunset); accept and share the apples in the evening with others. Mentally offer all fragrant flowers, fruits, gems, clothing. Sharanye triambake gauri narayani namostute." o Chandraghanta devi sits on a tiger, and radiates a golden hue. She manifests ten hands and three eyes. Eight hands display weapons while the remaining two are giving blessings and protection. o Special benediction: bliss, knowledge, peace and serenity, growtrh of all activities, purpose of life. She is worshiped in this form in Kanchipuram (Tamil Nadu) India. o We see expansion of red energies with pink lightning flashes going directly to the spinal column to strengthen to all activities, activate root chakra (mooladhara); activating birth/growth of new activities; opening of the heart chakra begins. Semicircular spiral energies of navy blue create movement in the spiritual and material zone for all auspicious, karma-freeing work. o Offering: Three bananas in the morning, light a candle morning-evening, accept and share banana prasadam with others. Mentally offer all fragrant flowers, fruits, gems, clothing. o Mantra to chant: "Om dukha hantraya namah"
o Kushmanda devi manifests eight arms, holding weapons and a rosary (mala), she is seated on a tiger and her aura is like the sun. o Special benediction: This aspect of Devi destroys sorrows of the mind and ego by harmonizing the macro-universe with the inner micro-universe of the individual. This makes available all realms of the external universe to the individual internally through meditation. She is the birthing mother presiding over birth and rebirth. The abode of Kushmanda is in Bhimaparvat. o We see streams of dark orange and golden light and golden drops that end in little drops of golden light entering the spinal column. These act like a spiritual surgical knife, destroying negatives and false ego positions. This is a good day to meditate on letting go bad habits/activities, asking forgiveness, being in touch with your true inner reality and position in the universe; your relationship with yourself, the universe, others in it and the Divine. o Offering: Four pears before 9 am--accept and share with others in the evening; offer candles /lamps morning-evening. Mentally offer all fragrant flowers, fruits, gems, clothing. o Mantras to chant: "Om hreeng mahadurgaya namah", and -- "Om nityaya namah". Each may be chanted separately not together. o Devi Skandmata holds her son Skand in her lap and sits on a lion. She manifests three eyes and four hands--two hands hold lotuses while the other hands offer protection and blessings. o We see the energies of Skandmata transforming other healing blessings of the Devis--now silver light streams out of the hands of people, opens up and becomes a ball of energy in the brahmsthaan of homes activating strength and wealth. Brings all the deva and devi blessings into the home. o Offering: Five bunches of grapes (you can separate a large bunch into smaller ones); offer candles morning-evening; accept and share the grapes in the evening with others. Mentally offer all fragrant flowers, fruits, gems, clothing. o Mantra to chant: "Om hreeng katyayini namah". o Katyayani Devi- a manifestation of Sri Laxmi-ji appeared as the daughter of rishi Katyayan and did penance for the purpose of getting Krishna as her husband. Her name means daughter of Sage Katyayan. Golden colored, she sits astride a lion and manifests three eyes and four arms. In two of her hands she holds a weapon and a lotus and with the other two she blesses and protects. o Special benediction: Kaatyayani devi is very protective and grants boons and fulfils wishes--especially relating to obtaining the association of the Supreme Divine--Sri Krishna. A yellow light of satisfaction emnates from her eyes and spreading into the eyes of people and allowing one to be satisfied with what is being seen and received in life. She radiates crescent-shaped yellow energies. o Offering: Offer six guavas in the morning and accept in the evening as prasadam and share with others. Offer candle/lamp morning-evening. Mentally offer all fragrant flowers, fruits, gems, clothing. o Mantra to chant: "Durga kshama shiva dhaatri svaha svadhaa Namostute"
o Kaalratri Devi has grey-black skin, flowing dark hair, manifests four hands--she holds a khadag (cleaver) and a burning torch, and the other two hands are protecting and blessing. She sits on a donkey. o Special bendiction: Kaalratri Devi is fearless, the destroyer of darkness and ignorance, she is the scourge of darkness and a reviver, mender of damaged relationships and opportunities. o We see grey, purplish silver and gold lights activating feet chakra of her devotees--this gives access to the lower universes of darkness destroying negative karma from past lifetimes. Negative energies are being processed through the roots of all plants and those not eating grains will specially benefit. The feet and toe chakras are activated to go forward into the light fearlessly and to actualize goals. Old stuck business activities or opportunities can be revived, resolved, and broken relationships mended, and one becomes famous through the blessings of Kaalratri Devi. o Offering: Seven "cheekoo" fruits (sapota or mud apple) in the morning; accept and share in the evening, offer candle/lamp morning and evening. Mentally offer all fragrant flowers, fruits, gems, clothing. o Mantra to chant: "Om nitya buddhaya namah". o Mahagauri the most fair, manifests as beutiful young girl with four arms radiating peace and compassion, she is often dressed in a white or green sari. Mahagauri holds a drum and a trident and rides a bull. o Special benediciton: Protects long life of husband, promotes association of good people keeps you away from robbery, theft. Girls of marriageable age should meditate on her to get good husbands, while men meditate on her get a wife with beautiful qualities--energies of creation, sexual fulfillment. o We see little dots of circular green and pink lights-activating knees, thighs giving freedom from fear, giving confidence and promoting the special benediction qualities. o Offering: Eight Custard apples-(shareefa, also known as sitaphal); accept as blessings in the evening and share with others; offer candle/lamp morning-evening. Mentally offer all fragrant flowers, fruits, gems, clothing. o Mantra to chant:"Kaali Kaali Mahakaali Kalike Paapharini, Sarva Vighna Hare Devi Narayani Namostute"
o Devi Siddhiratri is seated upon a lotus, surrounded by her devotees, manifests four arms, and grants 8 siddhis--perfections, to her devotees, as well as 18 other benefits. 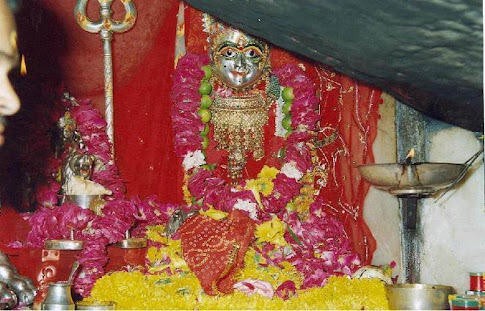 Siddhiratri devi's famous pilgrimage centre is located in Nanda Parvat in the Himalayas. o Special benediction: Most activating of spiritual awareness and consciousness--We see discs of golden light over crown chakras, instilling bhakti--devotional service to the Supreme, and liberation from karmic bindings. The energies of Sri-Sri Sita and Ram manifest fully on the 9th-10th night for the victory celebrations on the 10th day--Vijay Dashani or Dusshera. The 10th day is the victory of Lord Ram over evil and negativity, and the spreading of His Divine Grace in the material world. o Offering: 9 oranges or 1 each of all previous 8 fruits and 1 orange; accept and share with opthers in the evening; offer candle/lamp morning-evening. Mentally offer all fragrant flowers, fruits, gems, clothing. Pandith Raghavendra is India’s No 1 Gold Medalist Astrologer in London if any problems please contact by Best Indian Astrologer in London.